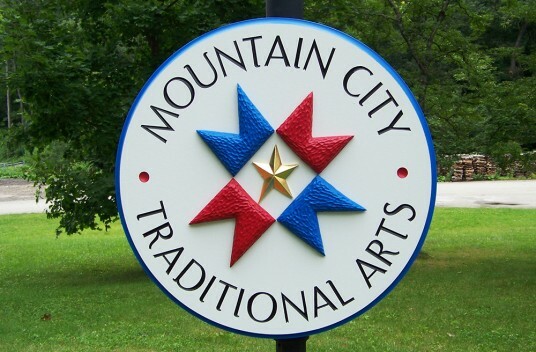 Located in the arts and entertainment district of Frostburg, Maryland, Mountain City Traditional Arts is a program of Frostburg State University, dedicated to the education and support of traditional arts in the Mountain Maryland region. Staffed by students of the university, the center is home to a diverse display of local handcrarted items and local artwork. Here you will find everything from handmade soaps, pottery, woven products, baskets, blacksmithing, woodwork, home made instruments, herbal products and knit item to chilren’s crafts and paper art. Be there at the right time and you can catch a live concert of folk music, or a workshop on song writing. Offering a variety of classes, Mountain City has continued to showcase traditional arts and crafts and is helping to preserve the precious heritage of the Appalachian mountain region. Danthonia was happy to be part of this worthwhile venture when we were approached to make a handcrafted sign for the center. Hand sculpted and incise carved, the sign was a good match for a place that appreciates all things that are made with the hands. The 23kt gold leaf gilded star added the final touch of class. 28 " x 28 "